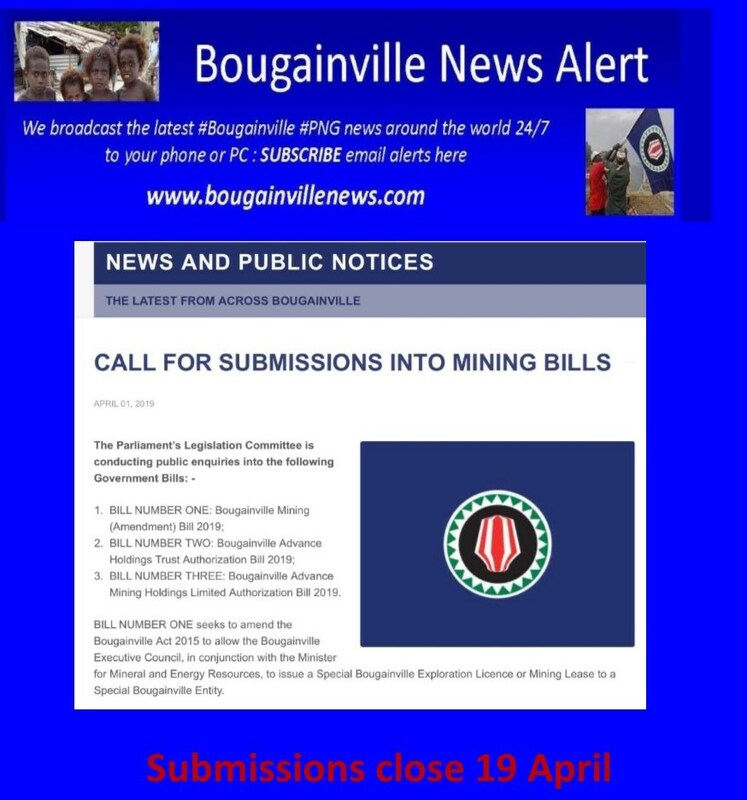 BILL NUMBER THREE: Bougainville Advance Mining Holdings Limited Authorization Bill 2019. BILL NUMBER ONE seeks to amend the Bougainville Act 2015 to allow the Bougainville Executive Council, in conjunction with the Minister for Mineral and Energy Resources, to issue a Special Bougainville Exploration Licence or Mining Lease to a Special Bougainville Entity. BILL NUMBER TWO seeks to establish a Trust (the Bougainville Advance Holdings Trust). BILL NUMBER THREE seeks to establish Bougainville Advance Holdings (AROB) Ltd as a commercial enterprise and business platform. The Committee is calling for written submissions from interested persons and organizations. We ask that Submitters be clear in their submissions which Bill(s) they are offering a submission on. Submitters can indicate whether they want to appear to give evidence orally. Further information about this enquiry is available and can be obtained directly at the Committee Secretariat Office location at Parliament House. The Committee will consider requests that a submission remain confidential and not be released to the public. BOUGAINVILLE ADVANCE HOLDINGS LIMITED AUTHORIZATION BILL 2019. The Bills which were withdrawn by the sponsoring Ministers were again reintroduced on the floor of Parliament and are now in the hands of the responsible Committee to conduct public consultations, and report to the House. Present a final report on its findings to the House in the next Parliament Session. While there is no set format for a submission to a select committee, you should aim to present your submission in a way that is ordered and easy to read. Head your submission with the name of the select committee to which it is addressed and the full title of the bill, inquiry, or matter under consideration. Provide the following information in a covering letter or at the top of your submission: your name or the name of the organisation you are representing; an email address; a contact address; and a daytime telephone number. If you wish to appear before the committee, include with your name your daytime telephone number and email address. If you wish others to appear in support, include their names and, if representing an organisation, designations. What are your organisation’s aims? If you are writing for an organisation, give brief details of the organisation’s aims, membership, and structure. Make sure that you have the authority to represent the organisation and note your position within the organisation. Who has been consulted? Note how much support you have and how widely you have consulted while writing the submission. When writing a submission, you will usually be making comments in relation to a bill or inquiry. While there are differences in the way in which a submission is written for a bill or inquiry, there are five basic principles that apply to both. Relevant Your submission must be relevant to the matter before the committee. A committee may decide not to receive a submission it considers not relevant. Clear Arrange your sentences and paragraphs in a logical order. Present a clear and logically developed argument. A submission that jumps from one issue to another and back again or jumbles unrelated issues together may confuse members and reduce its impact. Concise Be simple and direct. Do not write more than is necessary. An overly long submission may prove too long for members to consider fully. They want to know what you think and the evidence or arguments you have that support your view. Accurate Be accurate and complete. Include all relevant information. It will only confuse the committee if, in your submission, you refer to evidence or information that is not included. Make sure your facts are correct. An error-ridden submission will greatly reduce its impact and credibility. Conclusion Restate your recommendations in a conclusion at the end of the submission or an executive summary at the beginning. Consider listing your submission’s recommendations or summing up its main points. Writing a submission for an inquiry is different from writing a submission on a bill. As there are no specific clauses to comment on, use the terms of reference of the inquiry as a guide to presenting your views. You may then like to list any specific recommendations that you wish the committee to consider. It is essential to have a copy of the inquiry’s terms of reference to assist in preparing your submission. When writing a submission on a bill you should have a copy of that bill so you know what is being proposed. You will then be able to focus your submission on what the bill actually contains. First, state your general position on the bill, whether you support or oppose the measure being proposed, and give your reasons. Having stated your general position, make more detailed comments on the clauses that are of concern to you. If you feel that certain clauses need to be changed, say so, and give your reasons. You might also like to suggest new wording for the clauses that you feel ought to be changed. Using clauses as numbered in the bill is a good way to organise your submission. By bougnews  Posted in Bougainville Copper, Business and Investment, Climate Change, Enviroment, Government of Bougainville, Land Issues, News, Referendum	 Tagged Bougainville, Bougainville Copper, Bougainville Mining Act.